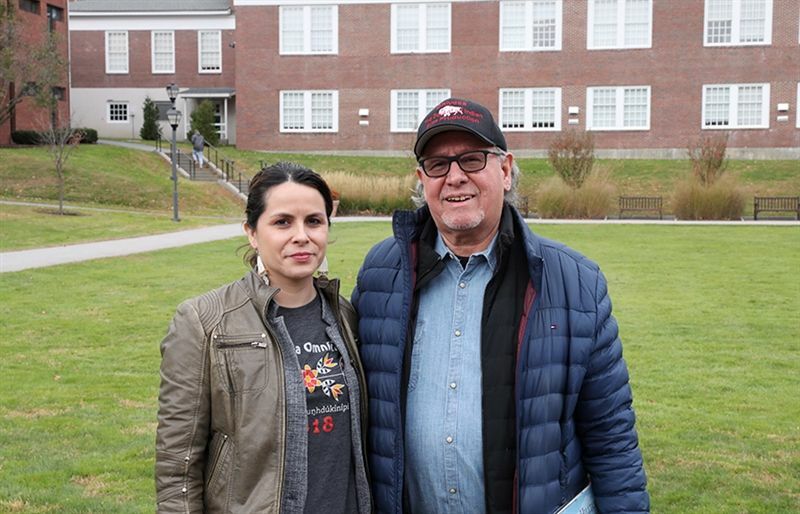 Dr. Kate Beane and her father, Syd, descendants of famed alumnus, Dr. Charles Eastman, Class of 1883, presented their documentary film, Ohiyesa: The Soul of An Indian, to the KUA Community. On Wednesday, October 24, Syd Beane and his daughter, Dr. Kate Beane, screened their film Ohiyesa: The Soul of an Indian, a documentary about their ancestor Dr. Charles Eastman, KUA Class of 1883, in Hayes Auditorium. The Beane’s also spoke to the Kimball Union community at All School Meeting before guest-lecturing in Joshua Hunnewell’s Spanish class and engaging in open discussion with students and faculty at the Scholar Program Luncheon in Coffin Meeting Room. Charles Eastman attended Kimball Union for two years and went on to attend Dartmouth College, where he was captain of the rugby team, an accomplished orator, elected speaker of his class, and so revered by classmates that they commissioned a 7 ft portrait of him that resides in the Hood Museum at the College. Eastman attended medical school at Boston University and following his graduation in 1890, he became the first Native American physician at the Pine Ridge Reservation in South Dakota. Dr. Eastman was the responding doctor to the Wounded Knee Massacre in 1890. For more information about Dr. Charles Eastman, please visit Kimball Union Archivist Jane Fielder’s 2012 article, and for more information about Ohiyesa: The Soul of an Indian, click here.